Sovaldi: A cure for Hepatitis C - or just good business? Was a deal to import a new Hepatitis C drug made to save Egypt's record-breaking number of infected patients - or make a profit? A narrow door of the National Liver Institute hides an open area where a few hundred people are sitting, waiting for medical check-ups and hoping to receive a new Hepatitis C drug called Sofosbuvir. "I heard there is a paper to be signed about the side effects of the drug," said a patient in her 30s. "We booked a medical visit but the required medical results came out too late, so we missed the appointment," she added, appearing confused. An atmosphere of doubt also dampens euphoria over the new drug. Sofosbuvir – commercial name Sovaldi – was approved in the United States in December 2013 and entered Egypt on 16 October 2014. It is being sold in medical centres affiliated to the health ministry and will be available in pharmacies. Eight out of 26 medical centres are expected to receive 50,000-60,000 patients to be treated in the first phase of Sovaldi's administration. Until now, only three centres offer the drug. The number of patients is expected to be increased to 160,000 starting in June 2015. An effective drug is desperately needed. Egypt has the highest prevalence of the Hepatitis C virus (HCV) in the world, with 14 percent of the population infected and 11.8 million patients, according to the World Health Organisation. Every year there are 170,000-200,000 new HVC cases in Egypt. But there is controversy around Sovaldi, in the ways it's being administered and its cost – not to mention a deal between Egypt's government and the drug's manufacturers that has raised questions over its effectiveness. Patients being treated with Solvaldi have to sign a declaration that includes giving permission for their medical records to be used in drug analysis. Bassem Eissa, assistant to the president of the National Liver Institute, describes the document as a "post-market study." "[Such declarations] are signed everywhere in the world. It is a normal and healthy process in order to evaluate the drug's effectiveness as well as its side effects," Eissa said. But Seoudy says the declaration is proof that "the treatment is still in the experimentation phase." The types of treatment have also raised questions. For example, the new treatment was registered as a tripartite administration of Sovaldi, Ribavirin and Interferon injections for three months. But it is also being offered in dual form: Sovaldi and Ribavirin for six months. "The dual treatment still needs further experiments in order to be widely used," Mohamed Ezz El-Arab, president of the Cancer Treatment Unit at the National Liver Institute, told Ahram Online. This was echoed by Mohamed Fouad, a rights lawyer and director of the ECRM, who said the dual method has not been approved by the US Food and Drug Administration (USFDA). A member of the National Committee for the Fight Against Liver Viruses, who spoke to Ahram Online on condition of anonymity, said Sovaldi has been approved. Studies by Egypt's National Liver Institute, Cairo University and Mansoura University will be published by the American Association for the Study of Liver Diseases in November, the source said. The studies used only Sovaldi – not the dual or tripartite treatments – the source said, adding they were undertaken after the FDA and the EMA (European Medicines Agency) had approved the drug. The US conducted experiments with just Sovaldi on patients with genotype 4 of the virus, which is the type present in Egypt, the source said. The number of patients for the US clinical trial was 28, with a 96 percent success rate, and 103 patients in Egypt with an 87 percent success rate, according to Seoudy. These figures – and the type of studies – have prompted some doctors to doubt the medicine's safety. "As a pharmacist, I can say the number of experiments is not sufficient," said Seoudy. Sovaldi has been promoted as a drug that will be sold for LE2,200 per box. But of the 50,000-60,000 patients to be treated in the first phase, only around 0.4-0.5 percent will receive the drug at this price from ministry-affiliated medical centres. Pharmacies will reportedly sell Sovaldi for around LE14,940 per box. Other patients will be treated for free as part of a government health programme. Eissa says not all patients need the drug – only 20 percent of about 180,000 patients are in need. The situation is "stable," he says. "Some 600,000 people have registered on the website, which is the number of people who knocked on our door," said the committee member, in response to why the number of targeted patients was far less than the total number. He added that not all patients who register fulfill the conditions for treatment, including the type of virus concerned, adding there will be new treatment phases and other drugs. Egypt's health ministry brokered a deal with US biopharmaceutical company Gilead Sciences to import the drug at a heavily discounted cost – but in a deal overshadowed by a lack of transparency, some say. "There is no transparency in the agreement between the health ministry and the company that produced the drug," said Mohamed Seoudy, adjunct to the Pharmacists Syndicate. The syndicate filed a report with the prosecutor-general, which they announced at a press conference in late October, calling for an investigation into the deal. Egypt's President Abdel-Fattah El-Sisi has reportedly asked for the Sovaldi file containing details of the Gilead deal, according to the Egyptian Centre for the Right to Medicine (ECRM). Adel Abdel-Maasoud, president of the division of pharmacy owners at the Chamber of Commerce, said Egypt received the drug from Gilead for 1 percent of Sovaldi's price. 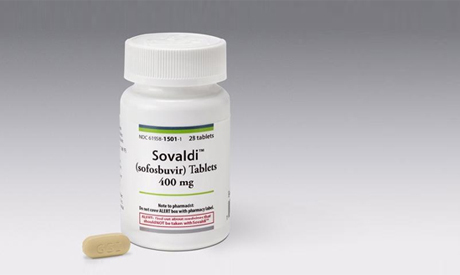 Sovaldi is sold in the US for $84,000 (LE600,444) for a three-month treatment. In Egypt, the treatment is LE6,600 at the health ministry's medical centres (LE2,200 per box, which contains 30 pills, at one pill per day). Tens of other countries have received the drug at the same lowered price, depending on the country's economic status. According to Fouad, the examinations cost between LE800 and LE1,500. The centres receive between 100 to 800 patients every day. But Sovaldi could be cheaper, insists Fouad, as Egypt has the right to produce the drug at a minimal price with no commercial gain through governmental companies, according to international and Egyptian law. Any country with an epidemic has the right to produce a drug as the producing company loses the patent – a method called "compulsory licensing," according to the TRIPS (Trade-Related Aspects of Intellectual Property Rights) agreement signed in Doha in 2002. Under national law, the prime minister has the right to decide to produce – using the active pharmaceutical ingredient (API) – any drug in the case of a health threat to national security, according to Article 22 of the Egyptian Law for Intellectual Property. Given the rate of HCV in Egypt, such conditions can be said to apply. "The government has made Egypt lose this right," said Seoudy, adding that the drug can be produced in Egypt through a license from the government after which the company sends Egypt the production file. Mostafa Ibrahim, adjunct to the ministry of health for pharmaceutical affairs, declined to comment on the matter, responding that questions about the deal with Gilead should be addressed to the minister or the central administration for pharmaceutical affairs. However, the deal does allow Egypt to import the drug more cheaply from India, according to information provided by Nick Francis, media spokesperson for Gilead. Indeed, the company signed a licensing agreement with seven Indian companies to develop and market the drug, and they can set the price for it and receive a "complete technology transfer of the Gilead manufacturing process." The production of a "similar drug" using the same API is an alternative to compulsory licensing. Indeed, 12 companies registered to produce similar drugs to Sovaldi. But Seoudy questions the basis on which those companies gained the rights to produce equivalents. The registration for producing similar drugs follows a system where 12 slots are available: 10 for private companies and two for the public sector. According to Fouad, the problem is that the first five companies who registered were directly contacted, while another company sold its registration file for LE5 million. According to the law, the drug registration file should be sold for LE30,000. The registration file of a company consists of an ownership license in addition to a registration at the administration of pharmacists to produce the drug. Sofosbuvir's API price is between $68 and $136 (LE489 to LE979), according to a study published on 6 January 2014 by Oxford University. The production of the similar drug can be done by either by importing the API or producing it. All similar drugs rely on breaking the enzymes that help the virus to reproduce. The Pharmacists Syndicate says there is a "conflict of interest" in Sovaldi's deal because the doctors who negotiated with the producing company Gilead are the same doctors who reportedly worked on the drug's research phase, in cooperation with Gilead, according to Seoudy. An insurance document stirred concerns, mentioning the producing company's name as well as the names of three doctors at the National Committee for the Fight Against Liver Viruses. Another concern is that the distributing company in Egypt is private. According to Article 144 of Law 127 of 1959, the Egyptian Company for Medicines Trade is responsible for the distribution and storage of drugs, and has a pharmacy in every national medical centre, including one at the National Liver Institute. "The mother company (Gilead) insisted that the company that distributes the drug be private (Quadri Pharma) for the first time. It is the company's agent who insisted. Everyone is asking questions about this, because we (Egypt) are supposed to have the freedom of choice," said Abdel Maasoud. Francis, Gilead spokesperson, responded: "Quadri Pharma is our partner for all our products in Egypt and has been for some time." Thanks;to what's new but I think that there is a lot of time to give sovaldi on a wide base expet after using it on a larger scale.